Former speaker of the Colorado House of Representatives Andrew Romanoff is set to announce he'll be launching a campaign for the U.S. Senate, hoping to win the Democratic nomination and then challenge incumbent Republican Senator Cory Gardner, according to a report by Colorado Politics. 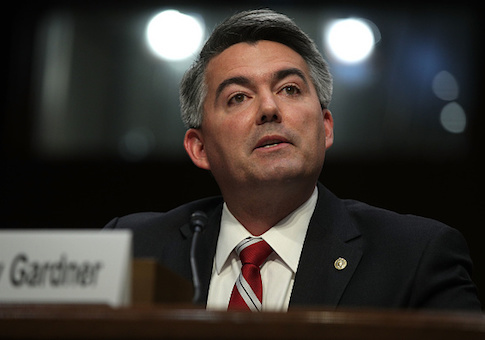 Gardner's seat is one of the top takeaway targets for Democrats in the 2020 cycle. In 2016, the state went for Hillary Clinton by more than 135,000 votes, or a 48 to 43 percent margin. And the 2018 elections witnessed a blue wave across the state, with Democrats winning all statewide offices, and winning several down-ticket races that weren't expected. Romanoff has a long resume in local politics, serving in the state's lower chamber from 2000 to 2008, and also serving as the speaker in the last three of those years. In 2014, the same year Gardner was elected to the Senate, Romanoff ran for Congress challenging Republican Mike Coffman in Colorado's 6th Congressional District. However, years of cultivating ties with minority communities in the district allowed Coffman to cruise to reelection 53-42. Coffman later became a symbol of the strength of the state's 2018 blue wave. Despite having beaten well-funded and well-known Democratic candidates like Romanoff for several cycles in a very competitive district, Coffman fell last November to Democrat Jason Crow, a lawyer and a complete newcomer to Colorado politics. Last week, former Colorado state senator Mike Johnston announced his candidacy against Gardner. Johnston is fresh off a failed gubernatorial run in which his campaign was largely funded by former New York City Mayor Michael Bloomberg. Still, the race may hinge on decisions from former Colorado governor John Hickenlooper, who left office last month because of term limits. Hickenlooper is currently exploring a presidential run, but hasn't ruled out a senate bid should the presidential effort crater. Hickenlooper recently told a local outlet he had received a call from Senate Minority Leader Chuck Schumer (N.Y.), which lent more credence to the theories that a Senate run would be a plausible fall back for Hickenlooper if the presidential ambitions don't pan out.